Vitamin D and probiotics are two essential nutrients for healthy childhood development. 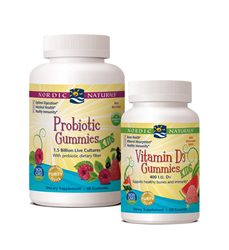 Probiotic Gummies KIDS and Vitamin D3 Gummies KIDS are a potent complement to any Nordic Naturals omega-3 product for children. Nordic Naturals has been revolutionizing omega-3s since 1995, pioneering a new definition of fish oil as it relates to purity, freshness, taste, and dosage. Based in Watsonville, CA, the company also offers complementary, foundational nutrients essential to health. Their portfolio, which is distributed to over 35 countries, includes more than 200 products in a variety of flavors and formulations for adults, kids, athletes, and pets. Family owned, Nordic Naturals works passionately to see generations of healthier, happier people around the world. Further information is available at http://www.nordicnaturals.com.